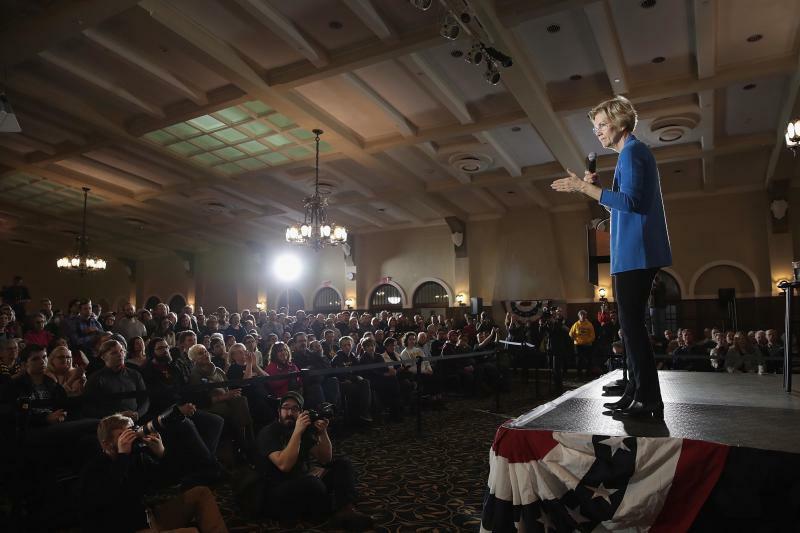 Presidential candidate Sen. Elizabeth Warren, D-Mass., at an organizing event in February. 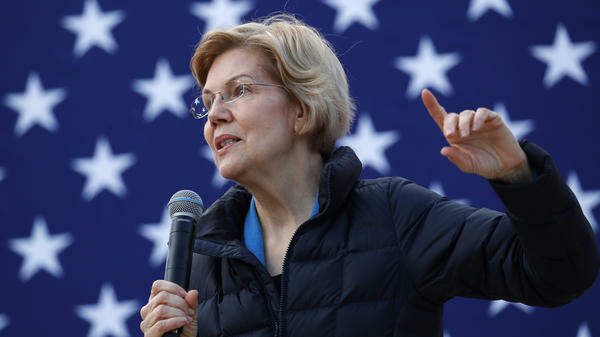 Warren says she wants to get rid of the Electoral College, and vote for president using a national popular vote. Former Rep. Beto O'Rourke said there is a "lot of wisdom" in the idea and Sen. Kamala Harris, D-Calif., also said she's open to it. The politicians are tapping into what's become a popular position with many voters, especially Democrats. In the U.S., 65 percent of adults think whoever wins the popular vote should hold the nation's highest office, according to an Atlantic/PRRI poll last year. Under the current system, voters in each state cast their ballots for electors, of which 270 are necessary to win. So it's possible for a candidate to win more votes overall across the country than a rival but not be inaugurated because of insufficient support from the Electoral College: a scenario that has occurred twice in the past two decades. But experts say reforming this practice isn't likely anytime soon for a number of reasons. First, there's the Constitutional problem. Fully overhauling the way the president is selected would take a Constitutional amendment, which would require the votes of two-thirds of the U.S. House of Representatives, two-thirds of the Senate, and three-fourths of the states. Support of that magnitude has become rare for anything in a sharply divided United States. An amendment hasn't been adopted since the 27th, in 1992, and one hasn't been adopted relatively quickly since the 26th, which took 100 days from proposal to adoption in 1971. President Trump once supported abolishing the Electoral College — he previously felt it was a "total disaster for democracy" — but since his 2016 presidential victory over Hillary Clinton, in which Clinton won the popular vote by almost 3 million votes, but Trump received 304 electoral votes, he has changed his mind. Now, Trump feels the Electoral College is "far better for the U.S.A." as he wrote Tuesday on Twitter. That position, shared by many Republicans, makes it highly unlikely that there would be sufficient support for changing the system. "There's no realistic chance of a Constitutional amendment to abolish the Electoral College," said Jacob Levy, a professor of political theory at McGill University. There may, however, be another way. A number of states have signed onto a pact that guarantees their Electoral College votes to the winner of the popular vote, no matter the outcome in their individual states. The compact would only go into effect once the number of states involved surpasses the 270 Electoral College vote threshold that is required to win the presidency. Today the pact has the support of states — and Washington D.C. — that total 181 electoral votes, largely those that have gone for Democrats in recent years. The pact raises questions of its own for democracy: It creates a situation in which voters in, for example, Colorado, may cast most of their votes for the Democrat in a presidential race — but the state might wind up giving its electors to the Republican depending on the national outcome. That might invite legal challenges from candidates or voters' groups if it took place. Supporters of a national popular vote argue something must be done; the Electoral College disproportionately inflates the influence of rural areas while undervaluing the votes of cities. That, critics say, means devaluing the votes of many non-white voters too. 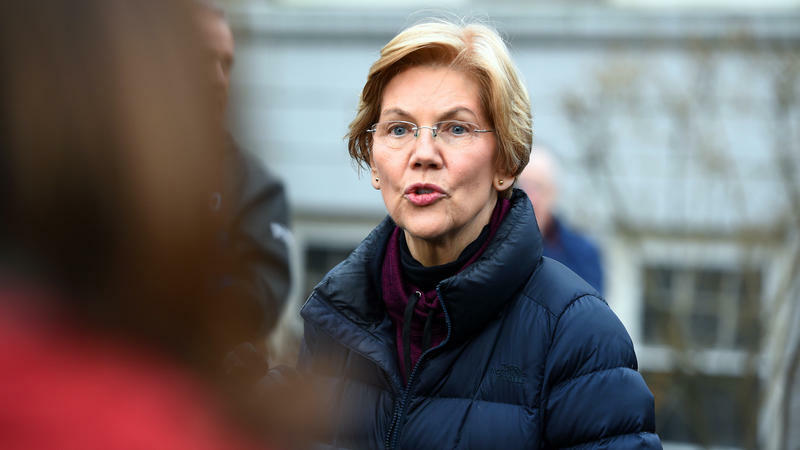 "It really does over-represent some sparsely populated states, and it provides some skew and bias to our system that I just don't think is healthy anymore," said Paul Gronke, a political scientist at Reed College. Gronke notes, however, that there would be major administrative challenges if the U.S. ever got to the point of switching to a national popular vote. Would the federal government get into the business of administering the elections, or leave that up to state and local officials, as it does today? Could Washington administer a national recount in the event of a close result? "How would that work?" Gronke asks. "You look at the Florida situation we had in 2000 — that already took a lot of time and effort, but imagine if that was done across the country. It's just not clear how you could do that." Gary Gregg, who leads the McConnell Center at the University of Louisville, says that if today's system over-privileges rural states, a national popular vote would be just as unfair in the opposite direction. Trump made a similar argument earlier this week, warning that "smaller states & then entire Midwest would end up losing all power." "The game will not be any longer to be a [politician who is] liberal but be able to appeal to a rural Ohioan," he said. "The game will be: Be a liberal — to the extent I can maximize votes in major urban centers." Jacob Levy, of McGill University, disagreed with that argument. "Precisely what it does is proportionately advantages where the people are," Levy said. "And places where there are more people become more important when you're counting votes." Still, Levy said if he had to bet on whether the U.S. will still be using the Electoral College in 20 years — he thinks it will. Texas electors helped officially send Donald Trump to the White House Monday. 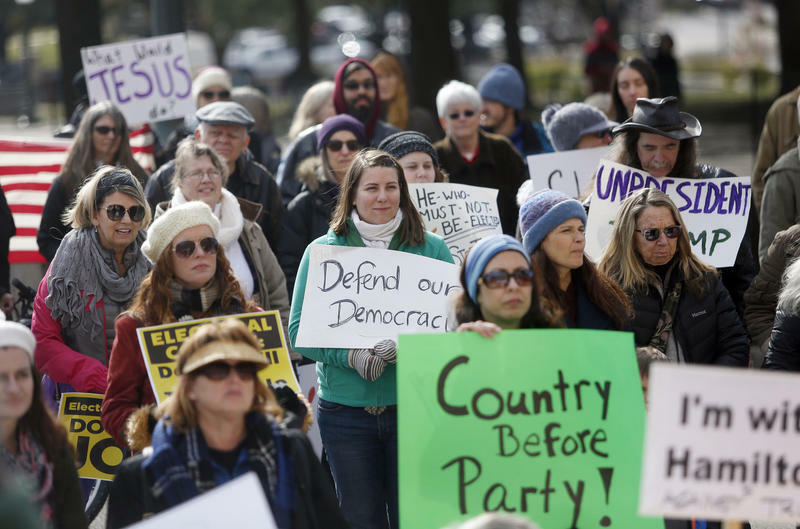 The 38 people in Texas who officially get to pick the next president were also met with hundreds of protesters at the Texas Capitol, though, who were hoping to convince them to vote for someone other than Trump. You probably remember the frustrations during the 2016 and 2018 elections: the long lines at the polls, the questions about whether our votes were being property recorded and whether voting machines were being hacked or not. A new study offers little comfort to those hoping 2020 will be better. 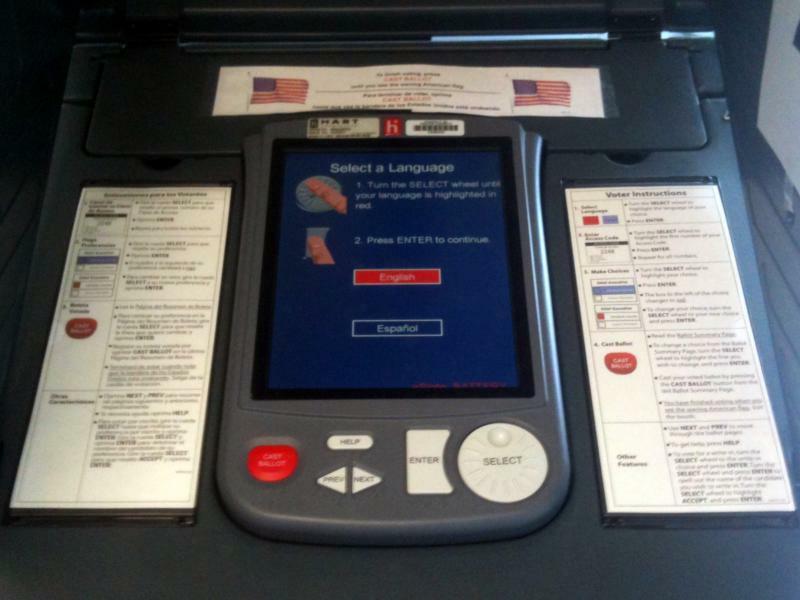 It finds that voting technology across the U.S. is outdated and falling apart.